What do you see when you fly up to the Koh Samui island? Sparkling blue sea, lush tropical saturated green vegetation, and ... of course, the palm trees! In fact, if you just walk around Koh Samui you will realize that the island is a one big coconut plantation. Palm tree tops are seen everywhere, as well as a sure sign of the presence of tourists - a hammock that in 90% is stretched between the trunks of two palm trees. Of course, coconut trees look simply amazing! However, banana and palm trees, with their broad waterproof leaves, are also a distinctive feature of a tropical paradise in the Gulf of Thailand. There are simply thousands of them! Sometimes it seems that they are grown in each and every garden owned by local residents. If to talk about food, literally falling from heaven to earth, the top prize in this category is taken by coconuts. However, in reality this is not entirely so. And let me tell you why. On Samui, many local houses are almost entirely surrounded by banana trees, which thanks to their broad leaves provide privacy and protection from the sun. If you live in a garden like that, then from time to time you might hear a sound of a falling tree. No, it's not a huge tropical monster trying to get into your house, breaking everything on its way. This is just a banana tree (some sources might refer it the palm trees, the others - to the trees, or bushes), unable to bear the weight of its fruit is falling down, wriggling its roots out of the ground. By the way, if a fallen banana trees is placed back the way it was it will continue to grow and bear fruit. 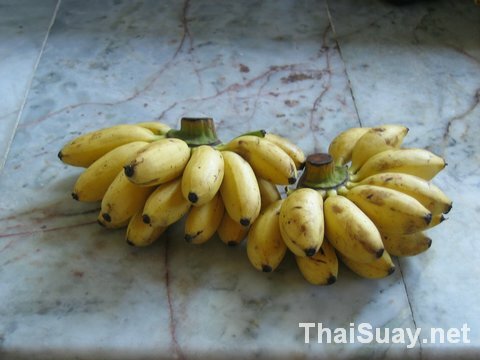 Thais grow over thirty varieties of bananas! This is, perhaps the most popular of the many available sorts that we like the most. Bananas should be stored like this: hanging from a piece of rope and not in the fridge! These bananas one can just eat, or fry on the grill in the sauce. They can be dried to make candy and cakes. Valued for its high nutritional value, often used for desserts. And this sort is called Kluay Leb Meu Nang («ladies fingers"). Probably dark curved ends of bananas somehow remind of a women manicure. This sort is more commonly used for deep frying or grilling. Why bananas are so popular, and how else can they be used in addition to eating them raw and as a dessert? In many recipes the Thai food is wrapped in those leaves before it gets steamed or cooked over the coals because the leaves would add a new flavor to the food during the cooking proccess. Also, banana leaves are used in various rituals and ceremonies - from weddings to funerals. They are a part of the decoration and offerings to the monks, they are often placed in the houses of spirits. Sometimes banana trees become the object of rituals - if someone sees a tree with fruit growing directly from the trunk, then it will be marked with bright tape as special. Many Thais believe that there are spirits living inside the trees. The locals really know how to use bananas at their best. The rind is a popular dye for the leather goods, the pulp is used for making sauces, fertilizers, and even some kind of local wine. Flowers are used for food, and the stems are used for making packaging for goods transportation. The fibers is used in making threads that go into the making of different things from mats to handbags and hats. Another use of banana leaves - a Krathong – a tiny raft with flowers, which is released in the waters of rivers, lakes and seas during the festival of Loy Krathong in November. This is a kind of collective gratitude to the water spirits for their benevolence to people and asking for forgiveness for extensive water use and pollution. There is a widespread belief that the banana’s birthplace is Central America. However, this is not quite so. Excavations proves that bananas came from the Malay Archipelago (Greater and Lesser Sunda Islands, the Philippines, Moluccas), and the first written mentioning of this fruit dated 5-6 century BC has been found in India. Bananas became very popular among the travelers who wants to take these exotic fruits home, and they can easily take root wherever there is a tropical climate. Since then bananas have started their journey over thousands of miles from home. In East Africa and then to the Canary Islands and the Caribbean the bananas were brought by slave traders from Arabia. 1876 is the official year of the appearance of bananas in North America, where it is still popular. Bananas are one of the best sources of potassium (maintains normal blood pressure, improves cardiac function, reduces the risk of cardiovascular disease, improves bone health, helps maintain fluid balance in the body, improves focus and concentration). Surprisingly, eating bananas reduces the inflammation of lymph nodes and prevents nocturnal calf cramps. Also, bananas contain calcium, iron, vitamins B6, B12, C, A, PP (by the way, those are water-soluble vitamins that are washed out of the body through sweat and eating bananas makes up for a deficiency that occurs in tropical climates). Bananas help our body to release a hormone of happiness - serotonin. That's why they are so popular in the treatment of melancholy and depression. The flowers of the plant are used in the treatment of gastric ulcers, dysentery and bronchitis. Infusion of banana flowers is usually prescribed for diabetics. The sap helps with stomach pain and neurological disorders. Young banana leaves heal burns and minor abrasions. The roots are used for treating dysentery and digestive problems. And the inside of a banana skin helps relieve irritation and swelling of the skin after insect bites (some sources say that in the same way you can even remove warts). 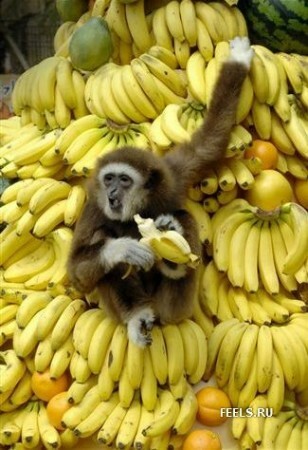 Looks like bananas is a true gift to humanity! Yes, Koh Samui is known as "Coconut Paradise", but if the locals are hungry - they eat bananas, instead of coconuts. Because in order to get a banana it is not necessary to climb up the tree to a height of 10-15 meters scratching your hands and feet (although this is supposed to be done by trained monkeys), and to open it, you don’t need a machete.